BEACONS – HOW THEY COMMUNICATE AND WORK! You might have experienced location-based messages when you visit malls, museums, airports etc. Till now you might have heard about the Beacons, but what do they actually do and how do they do it. Well, we have done some work here, just to make you figure out what exactly beacons are and how they communicate. Beacons are hardware devices usually small in size and are used to deliver location awareness and context-aware message/promotions. In simple words, beacons are dumb but they have their own Universal Unique Identifier (UUID), Major ID, Minor ID and some other device related info through which information is perceived on the user mobile device. The beacon transmits a small continuous radio signal. The signal is detected by nearby smart devices via Bluetooth Smart. 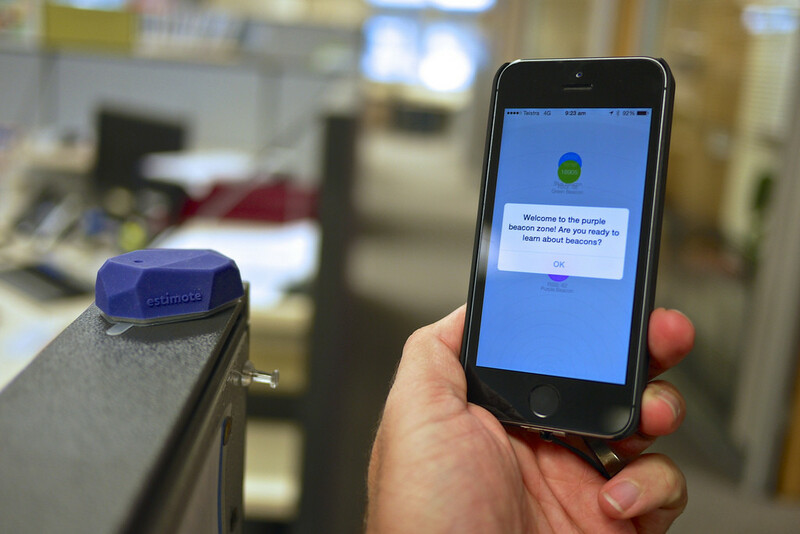 The signal tells your smart device that a beacon is nearby by sharing its ID number. Your smart device then sends that ID number to the cloud server. The server checks if what action is assigned to that ID number. And what that response will be? That’s up to you. Suppose you are passing through a market place and you just passed through your favorite clothing store. When the users pass through proximity beacon range, user’s gets push notifications on their respective mobile apps that show message information or promotion offers related to that particular product. Suppose, the user entered into the mall, the beacon device will trigger the admin and subsequently it will show pop up a message on the user device by saying “Hello, XYZ. Welcome to the Mall”. Further, if the user passes through the store he/she will get push up notifications with respect to the particular beacon acting in stores. Now, when the user entered the store, proximity-based messages/offers will be displayed on a mobile device with respect to the particular section the user is passing through. This is how Beacon becomes interactive and engages the users on mobile devices. Previous Post Pokemon Go – An App Which Took Over The World In A Weekend! lunch break. I enjoy the info you present here and can’t wait to take a look when I get home. While reading this I thought for one moment you were going to say that you are winding down the website and focusing on that boring engineering stuff. I love reading blogs and articles when it is clear that the author is passionate about their subject, and this obviously describes your site. Hi my name is Lela Guzman and I just wanted to drop you a quick note here instead of calling you. I discovered your BEACONS – HOW THEY COMMUNICATE AND WORK website and noticed you could have a lot more visitors. I have found that the key to running a popular website is making sure the visitors you are getting are interested in your subject matter. I will email you the website.